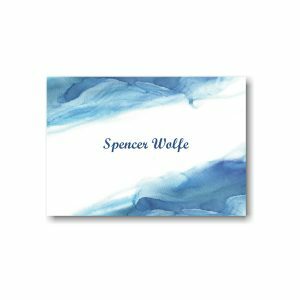 Digitally printed on one side of 120# white matte card stock, this stylish Bar Mitzvah invitation features watercolor splashes in shades of blue in opposite corners. Your wording details will be arranged as shown. Digitally printed on one side of 120# white matte card stock, this stylish Bar Mitzvah invitation features watercolor splashes in shades of blue in opposite corners. Your wording details will be arranged as shown. Measures 5″ wide by 7″ high. Shown with combination lettering styles Eras Medium ITC/Script MT Bold and black/deep blue inks. 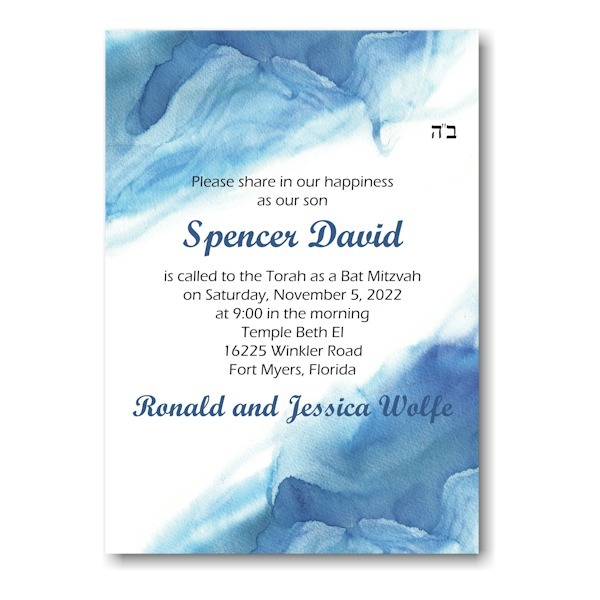 Single bright white matte envelopes accompany this budget-friendly Bar Mitzvah invitation.